JTI represents the complete line of Nucor U-channel sign posts and breakaway sign post systems, delineators, guardrail posts and cable barrier systems. Nucor’s breakaway sign support systems for small and mid-sized signs exceed crash impact standards by over 200% and maintain a cost of up to 50% less than other steel sign supports of comparable load bearing capabilities. RIB-BAK U-channel posts utilize new-billet steel with 25% greater tensile strength. 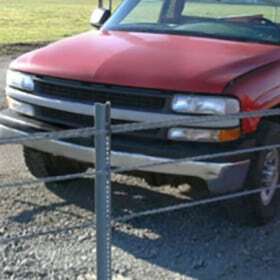 They are used to support Nucor’s roadway cable barrier and guardrail systems and provide a unique combination of effective protection, visual appeal and economy in both median and shoulder applications.